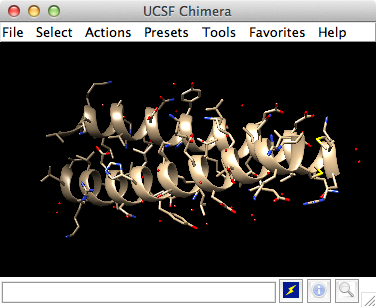 This tutorial provides an overview of basic features in Chimera. You can interact with Chimera using menus and/or commands. 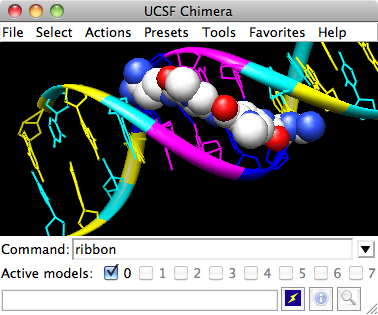 The basic features of Chimera are available either way, but not all command functions are available in menus or graphical interfaces, and not all menu or graphical interface functions are available in commands. Thus, it is useful to become familiar with both ways of interacting with Chimera. The Working with menus and Working with commands sections are independent of each other and (for the most part) cover identical operations, accomplished in different ways. If you go through both sections, you can skip portions that cover issues you already understand. You can also go back and forth between the sections to see the correspondence between menu and command operations. Start Chimera by clicking or doubleclicking the Chimera icon (depending on its location). Typically, this icon will be present on the desktop. The Chimera executable can also be run from its installation location. A splash screen will appear, to be replaced in a few seconds by the main Chimera window containing either the graphics display or the Rapid Access list of recently used files (it doesn't matter which, since opening a structure will automatically switch the display to the graphics window). If you like, enlarge the window by clicking and dragging its lower right corner. The window can also be moved by clicking its top bar and dragging. Now open a structure. Choose File→Fetch by ID from the menu and enter 1zik as the ID of the structure to fetch from the PDB. 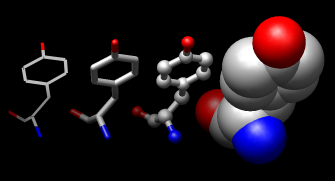 The structure will appear in the graphics window; it is a leucine zipper formed by two peptides. 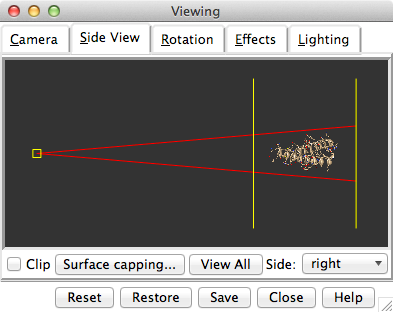 Show the Side View for interactive scaling and clipping (menu: Tools→Viewing Controls→Side View). By default, the Side View is also listed in the Favorites menu. It shows a tiny version of the structure. Try moving the eye position (the small square) and the clipping planes (vertical lines) by clicking and dragging with the left mouse button. The Side View will renormalize itself after movements, so that the eye or clipping plane positions may appear to “bounce back,” but your adjustments have been applied. If you are using a touchpad or single-button mouse, modifier keys allow emulating the middle and right mouse buttons. These are option and command ( ) on Mac keyboards. Multitouch gestures on a Mac touchpad are enabled by default, but can be turned off in the preferences (menu: Favorites→Preferences, category Mouse). Continue moving and scaling the structure with the mouse in the graphics window and Side View as desired throughout the tutorial. The arrow keys can be used to broaden (↑), narrow (↓), or invert (→) a selection. The hierarchy for broadening and narrowing a selection could include (depending on the initial selection): atom/bond, residue, protein secondary structure element, bonded set of atoms, all atoms with the same chain ID, entire model. When a selection is inverted, the selected atoms become deselected and vice versa. Spend some time selecting various parts of the structure. An easy way to clear the selection (deselect everything) is to use Ctrl-Btn1 in any blank space in the graphics window. Atoms/Bonds Controls the display and representation of atoms and bonds. Ribbon Controls the display and representation of ribbons. Surface Controls the display and representation of molecular surfaces. Color Colors selected objects. Color target can be limited to object types in the all options dialog. Label Labels selected atoms. The residue submenu labels residues containing the selected atoms. Focus Focuses the view on the selected atom(s), zooming and translating if necessary. Set Pivot Sets the center of rotation based on the selected atom(s) without adjusting the view. Inspect Launches the Selection Inspector; same as clicking . Write List Writes a list of the currently selected objects to a parsable text file. Write PDB Writes the coordinates of the currently selected atoms to a PDB file. In general, operations performed with the Chimera Actions menu apply to the current selection. Selections can be made in many ways, including with the Select menu or with the mouse (as described above). When nothing is selected, the Actions menu applies to everything. The following will color all residues named LYS hot pink. (Actions→Label→name would show the atom names instead.) These 3D labels move along with structures and are mainly for interactive use. For figures and movies, 2D Labels are recommended instead. 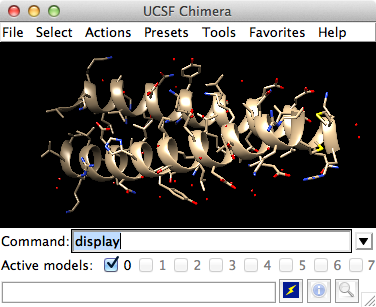 Generally, each file of coordinates opened in Chimera becomes a model with an associated model ID number. Models are assigned successive numbers starting with 0. The Model Panel lists the current models and enables many operations upon them. Open this tool with Tools→General Controls→Model Panel. Try toggling the checkboxes to see what happens; a model that is not activated for motion cannot be rotated or translated interactively. 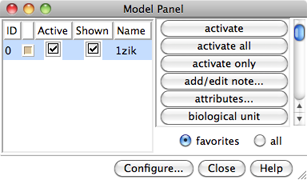 In the list of functions on the right side of the Model Panel (not the button at the bottom), click close to remove model 1zik. Use the Close button at the bottom to close the Model Panel. Go on to Part 2 below, or exit from Chimera with File→Quit. With Chimera started as described at the beginning of Part 1, open a different structure. 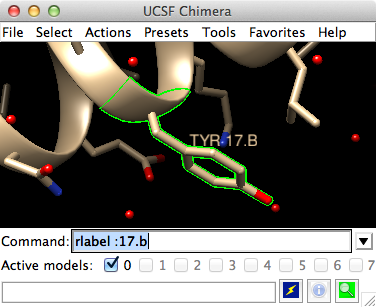 Choose File→Fetch by ID from the menu and enter 1d86 as the ID of the structure to fetch from the PDB. 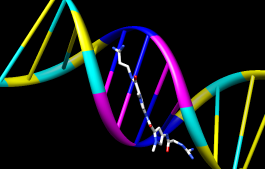 The structure contains the molecule netropsin bound to double-helical DNA, initially shown with ribbons and stylized representations of the nucleic acid sugars and bases. Rotate, translate, and scale the structure as needed to get a better look (see Using the mouse to review how this is done). Continue moving and scaling the structure as desired throughout the tutorial. Analogously, color DC residues cyan, DG residues yellow, and DT residues magenta. Clear the selection with Select→Clear Selection or Ctrl-click in empty space. 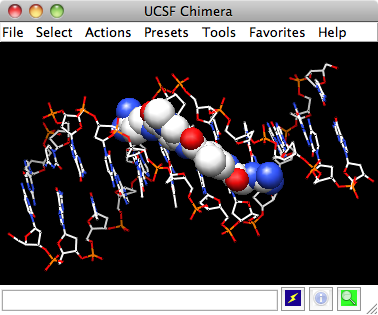 Finally, have some fun with molecular surfaces. There are built-in categories within structures such as main and ligand; when nothing is selected, Actions→Surface→show displays the surface of main. Clear the selection, change back to a solid surface, and then undisplay the surface. Choose File→Quit from the menu to terminate the Chimera session. Show the Command Line with Tools→General Controls→Command Line. By default, the Command Line is also listed in the Favorites menu. 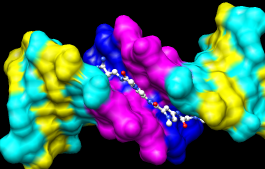 The structure will appear in the graphics window; it is a leucine zipper formed by two peptides. By default, the Side View can also be started from the Favorites menu. z< zone specifier z<zone or zr<zone specifies all residues within zone angstroms of the indicated atoms, and za<zone specifies all atoms (rather than entire residues) within zone angstroms of the indicated atoms. Using > instead of < gives the complement. hot pink is an argument that specifies a color name, and :lys specifies that the target is all residues named LYS. The Chimera Quick Reference Guide lists all of the commands and gives some examples of atom specification. It can be accessed by choosing Help→Tutorials from the Chimera menu and clicking the “Chimera Quick Reference Guide” link. The Active models line right under the Command Line shows which models are activated for motion. Unchecking the box for 0 makes it impossible to rotate or translate model 0 interactively. Checking the box again restores the movable state. A similar row of checkboxes for toggling model display can be shown using the preferences (menu: Favorites→Preferences, category Command Line). 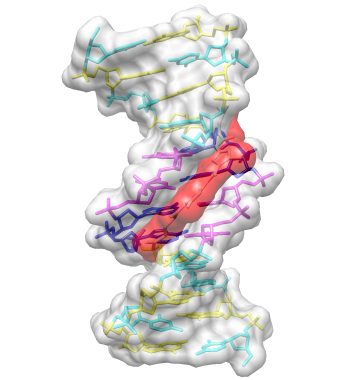 The structure contains the molecule netropsin bound to double-helical DNA, initially shown with ribbons and stylized representations of the nucleic acid sugars and bases. 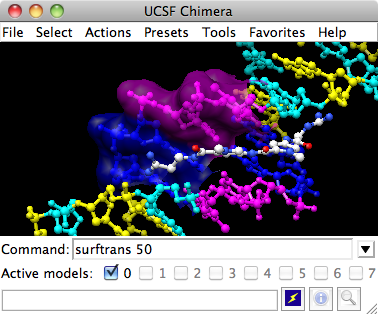 Finally, have some fun with molecular surfaces. There are built-in categories within structures such as main and ligand; when nothing is specified, surface shows the surface of main.